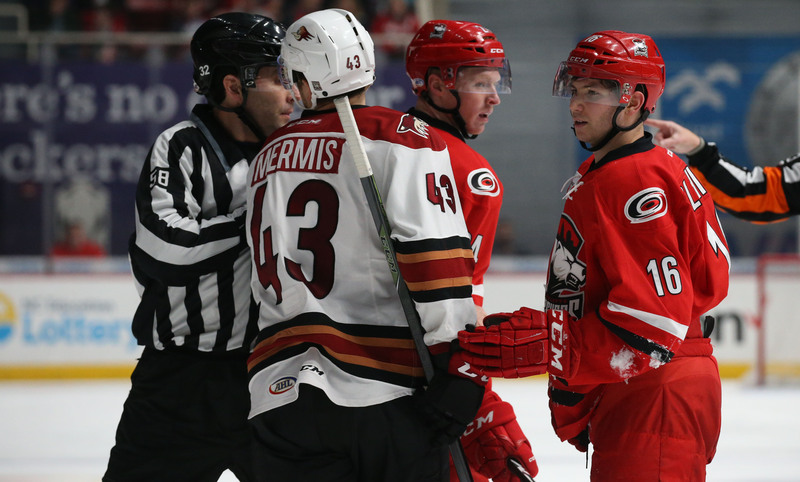 The Roadrunners’ franchise-long win streak was snapped in the club’s 3-1 loss to the Charlotte Checkers Saturday night at the Bojangles’ Coliseum. For Tucson, it ends the ride of five consecutive wins; it’s the team first loss since January 7. Justin Peters, who played parts of the three seasons with the Checkers while in the Carolina Hurricanes organization, got the call in net for the third straight game. Peters, even though he made 35 saves during the night, was on the losing end of Saturday night’s contest. Charlotte got on the board just past the midway point of the first period when Trevor Carrick’s shot from the point found its way through traffic and past Peters. Following up on a scoreless second period, the Checkers upped their lead to two when Andrej Nestrasil found the back of the net four minutes into the third. With just under seven minutes to play in regulation, Mark Olver registered the Roadrunners’ first and only goal of the evening, and his fourth in the past six games when he followed up on a Tyler Gaudet rush, potting the rebound past an out-of-position Alex Nedeljkovic. Tucson’s comeback attempt was short-lived, though. Charlotte reclaimed a two-goal lead 1:41 minutes after Olver’s marker when Levko Koper cashed in on a two-on-one sequence that was initiated after a Roadrunners turnover. 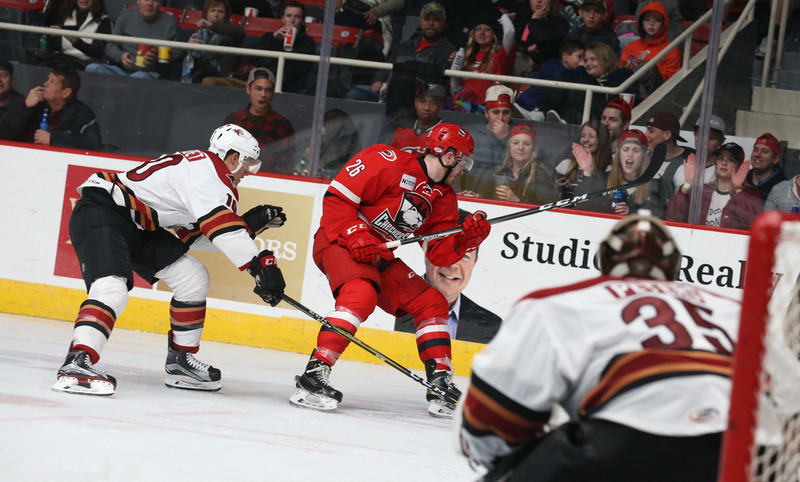 The Checkers took Saturday night’s affair – the first-ever between the two clubs, by a 3-1 final score. Saturday’s game was the first between the AHL affiliates of the Arizona Coyotes and Carolina Hurricanes since March 25, 2004 – when the Springfield Falcons (PHX) played the Lowell Lock Monsters (CAR). Anthony Duclair made his American Hockey League debut Saturday night, finishing the game with a -1 rating. The teams will return to the Bojangles’ Coliseum for a rematch on Sunday afternoon – a start of which will come in the morning hours in Tucson, scheduled for 11:00 AM MST. Following tomorrow’s matchup, the Roadrunners will return home to begin a three-game set against the San Diego Gulls at Tucson Arena, the first of which is slated for Wednesday night at 7:05 PM. You can purchase single game tickets for that series here.